GAP-Nepal offers you the opportunity to experience adventure, exotic cultures and unconventionality in the most mesmerizing and historic places on earth. Our treks, tours, expeditions and educational journeys through the Himalayas and greater Nepal — Mt. Everest, Mt. Kailash, Tibet, Annapurna, Kathmandu, Bhutan, to name a few — are carefully organized and bypass the ‘tourist jams’ in these areas. We have an interesting selection of itineraries to choose from, or offer you the opportunity to work with us to create an itinerary that suits your specific needs and desires. We tread lightly in many sensitive areas, always helping to preserve and protect the environment. Our treks and tours are affordable and accommodating, bound to ensure the ‘Journey of a Lifetime’. Everest Trekking or Trekking in Everest region is the most popular trekking route in Nepal. Everest Base Camp would possibly be the most admired destination, but it is also far away comparing to the other regions. If you choose by walking trail, it takes either walk for 10 days or fly to Lukla, Lukla airport where flights are notoriously unreliable. Everest Trekking is excusably famous, not only for its proximity to the world's highest Everest (8848 m.), but also for the mountain culture of Sherpa villages and Buddhist monasteries. 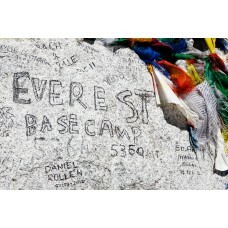 The primary goal of an Everest Trekking is the Everest Base Camp at height of about 5340 meters. But to capture the spectacular view of Everest most climb up Kala Pattar because we can’t see Everest from Everest Base Camp, spectacular view from Kala pathar will be your unforgettable memory from the Everest Trekking. The major impediment to an Everest Trekking is possibility of altitude sickness. This potentially deadly disease is caused by climbing too quickly to a high elevation. Be sure to read the section on mountain sickness in the Health & First Aid chapter if you are planning an Everest Trekking. If you suffer symptoms of altitude sickness and cannot go to Everest base camp, you can still motivated destinations such as Namche Bazaar, the administrative Headquarters of the Khumbu region; Khumjung or Thame, more typical Sherpa villages; or Tyangboche Monastery. From Tengboche you will have an excellent view of Everest and its more spectacular views of Ama Dablam (6856 meters).Even if you are not prepared for Everest Base camp, still you can visit other area along the Trekking in Everest Region. Sherpa culture of Sherpa villages, meditating thousand years old monasteries. The best time to trek Everest Region is beginning of March to end of May and beginning of September to end of December. You can choose the details of itineraries as per your desire and holidays.